For the last three years, Auckland, New Zealand, has been rolling out a new bus network in different parts of the city. Sunday, the final portion, the North Shore, got its new network, so the entire effort is complete. Bravo! I worked on the original design back in 2012 (with colleagues at MRCagney‘s amazing New Zealand office) and first explained it here. While public comments have led to revisions and improvements, the most important layer, the citywide frequent network, is almost exactly what we designed. An important complement to the bus network redesign has been a major increase in frequency on the city’s four commuter rail lines, which enabled us to offer outlying areas frequent connections to the rail line instead of a long bus route competing with it. Now, the New Zealand government has funded a huge project to extend this network underground through the city centre, so it will function like a proper subway system. This will further strengthen bus lines connecting with it and further reduce the need for lines running parallel. Each phase of the network has triggered gains in patronage — increases in total journeys, not just passenger boardings — so all that new frequency is clearly attracting new riders. Many people ask me about phasing. Does a new bus network have to be implemented all at once? The answer in many cities, including Houston and Dublin, is yes: The geography of the city is so interconnected and interdependent that trying to implement a network in pieces is just too much work. The interim phase in which the network is partly new and partly old becomes a huge network design challenge in itself, as well as a challenge for communications and operations. I’ve been back to Auckland several times since the network began rolling out, and it’s great to see this great Pacific city becoming more and more oriented toward great public transport. I’ll be back there in late November, to speak at an Auckland Conversations event, and look forward to getting places sooner on the new frequent network. Congratulations to everyone at Auckland Transport and the City for this great milestone. The plan had many important authors and advocates, but if I had to call out one it would certainly be Anthony Cross, the tireless head of bus planning who conceived this project and pushed it through, in a struggle of many years. I hope he’s happy today. North Americans are encouraged to make wistful comparisons to the eternally-deferred San Francisco Caltrain downtown extension and New York Gateway project. Further cause for antipodean triumphalism: similar projects are well-advanced in both Melbourne and Brisbane. Bus Network Design is a "Hot Trend"! 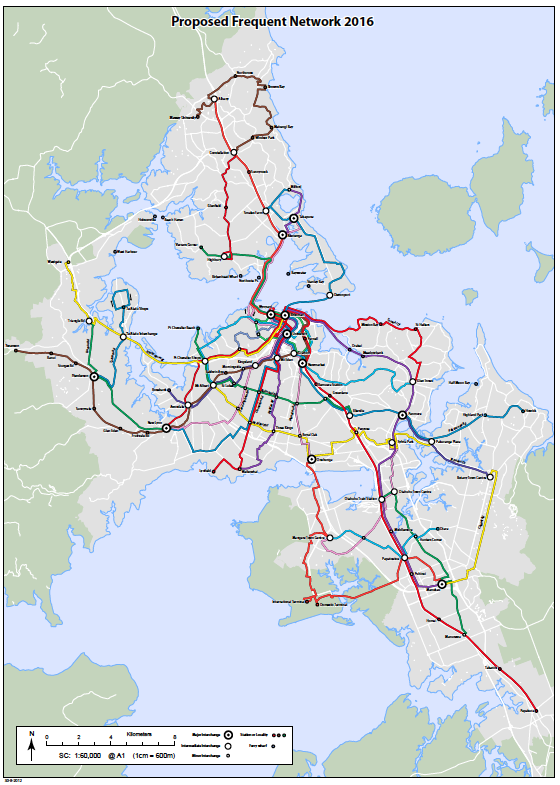 5 Responses to Auckland: The New Bus Network is Complete! ridership at each stage of the implementation. Lastly, huge thanks to you for your part in helping us launch the project back in 2012. Hi Jarrett, any comment about the chaos of both Wellington and Auckland’s new public transport implementation? Seems like you are 2 for 2! Minor teething issues at one station on day 2 are hardly cause for panic and JWA has never been involved with Wellington. Issues seem more than minor, but indeed, a day 2 trouble is not shocking to my eyes. I live in Auckland, New Zealand and in the area where I live we now get a more complex and worse service as we’ve lost our all day direct connection to the CBD – it now takes 2 buses outside the peak. From my house there are some journeys that are slightly faster (by not needing to walk as far for the direct service), but this is offset by the time penalties and other problems caused by interchanging on other journeys. I think while the interconnection logic may work in certain circumstances (e.g. a grid network city with frequent services), it doesn’t work in our case. The first problem is that many services only run at a half hourly frequency and there can be a considerable wait for the interconnecting service. Even when they should connect if the first service runs late you miss the connecting service. This happened to me in making a trip after the introduction of the New Network, where I missed a connection due to a late running service and had to wait 25 minutes for the next service. It took 1 hour 25 minutes to travel 11 km. Another point missed is that public transport is more useful to get to some destinations than others. In the case of our area it’s trips to the CBD due to the expensive parking. For most other trips driving is much faster than using PT so very few people use it. When you add on the inconvenience and delays caused by interchanging it looks even worse. You might want to contemplate why the Auckland Regional Transport model has an interchange penalty (to reflect the disadvantages of interchanging) in addition to the time taken in interchanging. I don’t think we’re the only area which has these issues as many areas in Auckland which are not near the 15 minute headway services are now getting a worse service. Home › Auckland › Auckland: The New Bus Network is Complete!